Finally our IRMA Kit No. 9 Tupolev Tu-12 is ready to go! 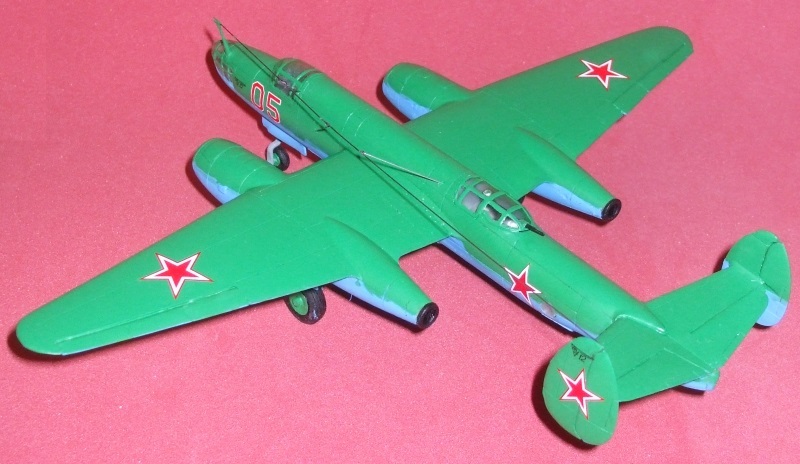 This model is the first multi-jet aircraft of the Soviet Union that served as an engine test bed although intended as a torpedo and dive bomber. 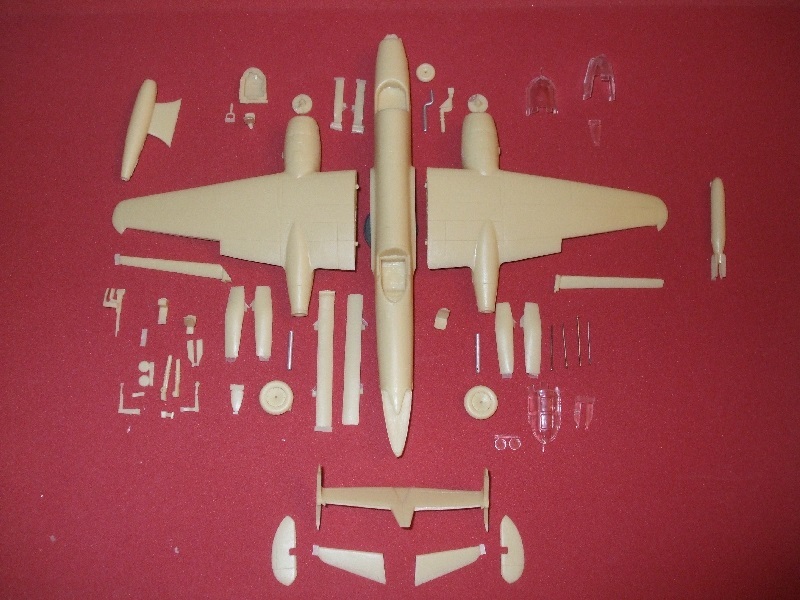 The kit consists of 60 parts including 53 in resin and 7 in metal. Landing gear can be metal or resin (metal is recommended). As with all IRMA kits, interior details are included. Flaps, ailerons, elevators and rudders can be positioned any way desired. Landing gear can be up or down, bomb bay doors opened or closed and there are clear resin and solid resin portals for the lower fuselage depending on the version built. There is also a bomb, an experimental Sanger ramjet and parts for wheel axials in case rotating tires are wanted. There were five prototype Tu-12s and one modified from the Tu-2 propellor bomber. There are several versions that can be built. It is suggested that you read the previous article on the Tu-12 and/or consult various aviations books and internet resources to decide which version to build. This is a decision best reached before commencing construction. As with our other IRMA kits, first make sure you have all of the parts. Then carefully trim or sand the excess resin from any that need it. A hobby saw is the safest means. Then sand to a smooth finish. To balance the aircraft, drill out behind the engine intake shields (parts 38 and 39) and add some lead weights such as fishing type sinkers, prior to installing the intake shields. Also, beind the pilot's seat can be drilled out to add more weight and some weight can be placed behind where the bombardier sits. This will prevent the model from becoming a "tail sitter" since it will balance for proper display. Starting with the wings, take the fuselage (part 1) and glue the port wing (part 2) in place, making sure it is at the correct angle. Next glue the starboard wing (part 3) in the same fashion. This can be followed by gluing the port aileron (part 37) on the port wing (part 2) followed by the starboard aileron (part 36) to the starboard wing (part 3). For the tail, glue the tail plane (part 40) onto the fuselage (part 1) again making sure that the angle is correct. Then follow by fastening the port elevator (part 41) onto the tail plane (part 40) then the starboard elevator (part 42) onto the tail plane (part 40). Next glue the port rudder (part 43) to the tail plane (part 40) followed by the starboard rudder (part 42). In regard to the engine intakes, place the port intake (part 38) into the port engine nacelle (part 2) and the starboard intake (part 39) into the starboard engine nacelle (part 3). For the landing gear take either of the port main landing gear legs (part 25 resin or part 26 metal) and insert into the underside of the port engine nacelle (part 2). Then cut the port axial (part 27) to size for the port main landing gear wheel (part 24) and place through the main port landing gear strut (part 25 or 26). Then glue the port outer main landing gear door (part 28) and inner main landing gear door (part 29) in place. On the starboard side, insert the starboard main landing gear strut (part 31 resin or part 32 metal) inside of the starboard engine nacelle (part 3). Then cut the starboard main landing gear axial (part 33) to fit the starboard main landing wheel (part 30). Next glue the outer starboard main landing gear door (part 34) to the engine nacelle (part 3) followed by the inner starboard main landing gear door (part 35). 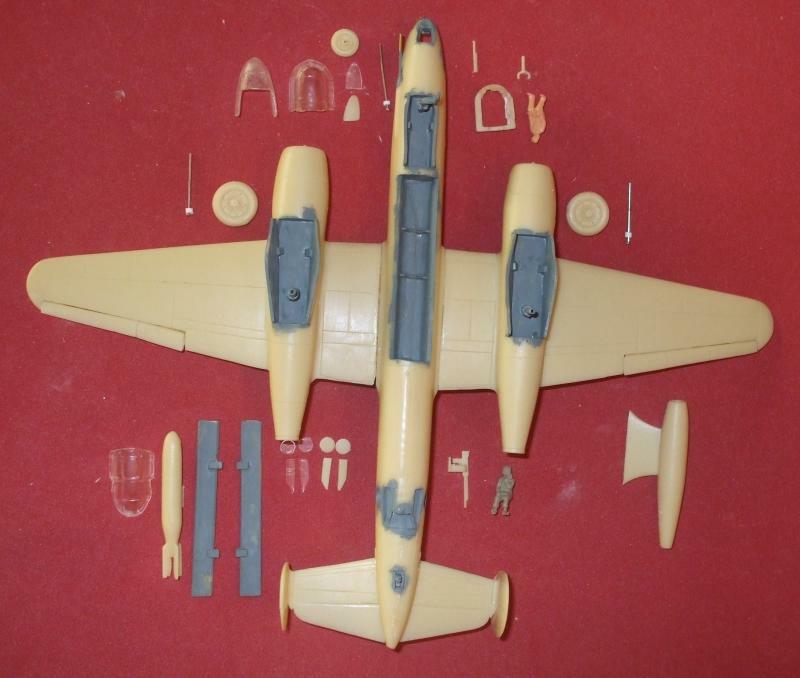 For the nose landing gear, insert the front landing strut (part 13 resin or part 14 metal) into the fuselage (part 1) and cut the front axial (part 16) to fit the front landing gear wheel (part 15). Then attach the port front landing gear door (part 17) to the fuselage (part 1) followed by the starboard front landing gear door (part 18). For the tail bumper, glue the bumper wheel (part 53) into the tail of the fuselage (part 1) and the port bumper door (part 54) and starboard bumper door (part 55). Cockpit assembly begins with insertion of the cockpit (part 9) into the fuselage (part 1) followed by the pilot's seat (part 10) and the control column (part 11) and a pilot, if desired, followed by the clear canopy (part 12). For the nose observation insert the observer's seat (part 4) to the front of the fuselage (part 1) and the observer's desk (part 5) with a figure, if wanted, then the front canopy (part 6) and either the clear lower glazing (part 7) or solid floor (part 8). For the aft gunner's position insert the rear gunner's ammunition supply (part 19) to the fuselage (part 1) and the rear gunner's seat (part 20) and then the machine gun (part 21) with also protrudes through the canopy (part 22). 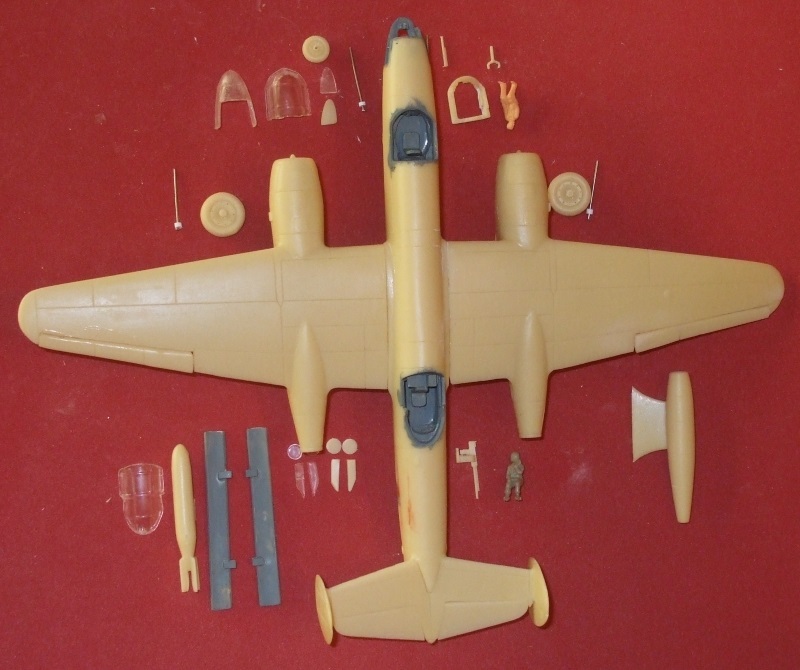 Insert a rear gunner figure is desired prior to fastening the canopy. For the lower gunner's position, place either the glazing or solid parts. This includes the port glazing (part 45) or port cover (part 47) and starboard glazing (part 46) or cover (part 48) to the fuselage (part 1) with the rear gun (part 23) into the rear opening. Next glue the clear portals or covers including the port portal (part 49) or port cover (part 51) and starboard portal (part 50) or starboard cover (part 52). For the bombay insert the 1000 kg bomb (part 56) into the fuselage (part 1) followed by the port bombay door (part 57) and starboard bombay door (part 58). In case the experimental engine is desired (part 60) glue to the top of the fuselage (part 1). Photos of the Tu-12 are in black and white, with no known surviving aircarft. Several depictions of the aircraft range from dull gray to bare metal. In most cases the Tu-12 appears to have a flat finish, whatever color(s) were utlized. First there is the monotone gray paint job. Very basic and probably the safest guess based on what we can tell from the black and white photographs. One variant is a two-toned gray schemtaic as depicted here. This might be a navel type of paint job, or an experimental. Hard to tell from existing photos. 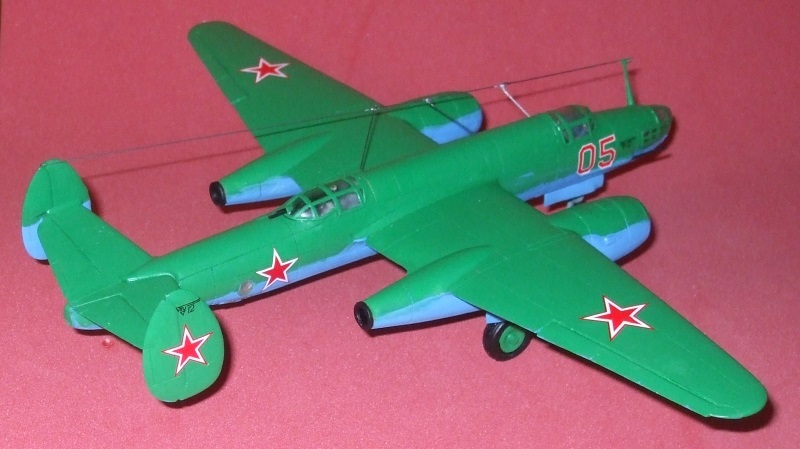 Another variant is based on the post-war production of the Tu-2 with Russian Green upper surfaces and Russian Blue undersides. 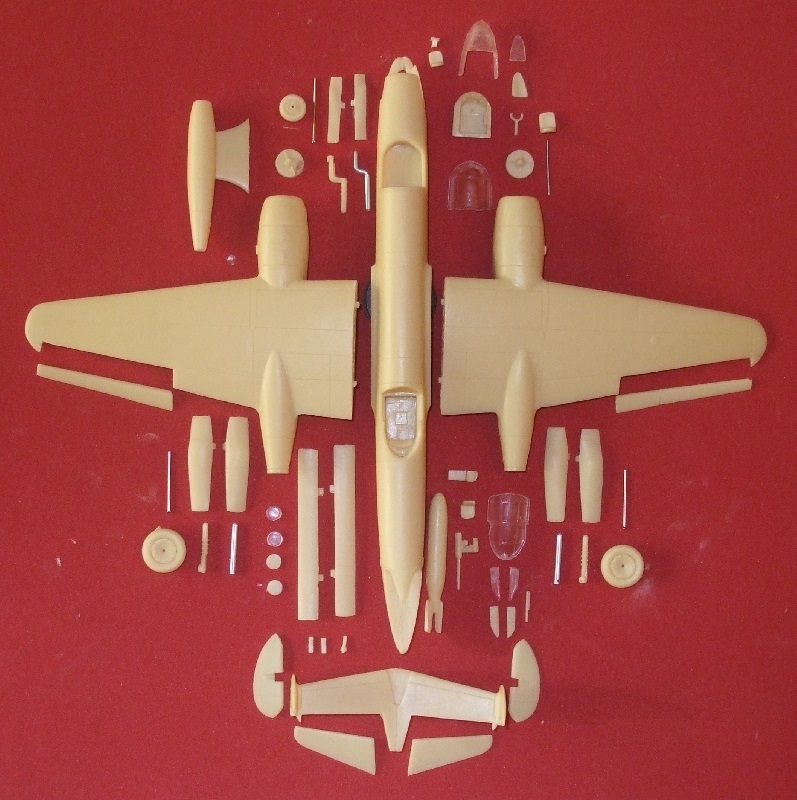 This may have been the type of coloration used in the mock war-games against the MiG-9s and Yak-15s in testing the jet aircraft against one another. 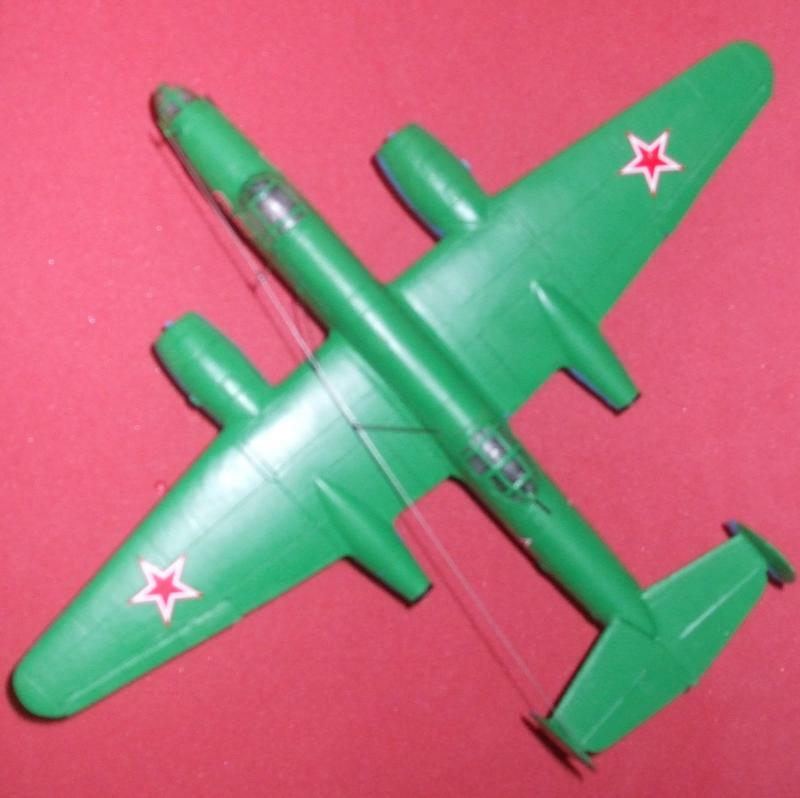 As a torpedo bomber, the Tu-12 could have been finished in the light green Baltic naval colors depicted here. 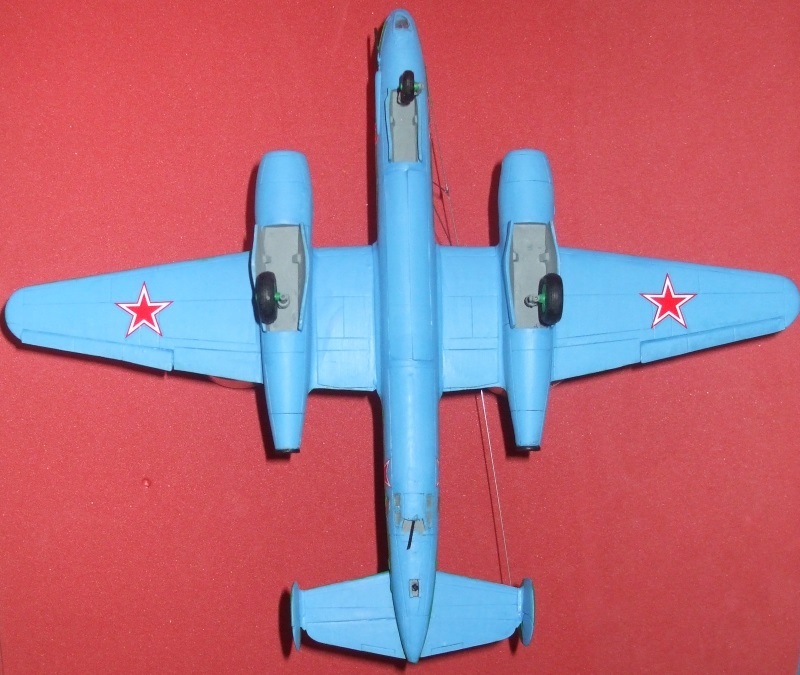 These are based on the MiG-13s of the Soviet Navy stationed along the Blatic Sea post-war. As one can observe, this color makes it very difficult to distinguish the detail of the aircraft, especially against water and sky backgrounds. For your bird, do the research and decide which version you'd like, then select the paint scheme. 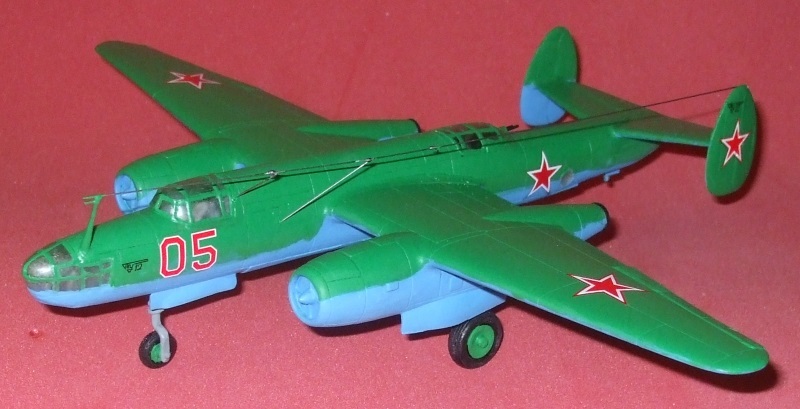 There are also other variations for the Soviet Air Force, Soviet Navy and etc. Interior color was a medium gray. 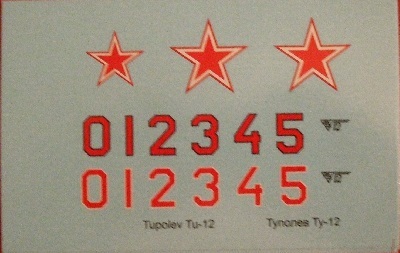 Placement of the Soviet Star was typically on the tail fin(s), fuselage and underside of the wings. In some cases the top side of the wings was also included. In the case of the Tu-12, on some examples the fuslage was excluded. Decal placement is at the discrestion of the builder. IRMA has also included numerals in red with white ouline and red with black outline as placed on some Soviet experimental and prototype aircraft. Notice too the Tuplev bureau logo with the aircraft number which goes just aft of the nose canopy on each side.